Clay Buchholz never thought his career was over, even after a surgery in which four hooks were screwed into the bone in his right arm to anchor a loose flexor tendon. "It felt just about how it sounds," Buchholz said. Buchholz went a season-high seven innings in the Diamondbacks' six-homer, 9-1 victory over the Miami Marlins in the first game of a three-game series Friday, and his presence has helped fortify a rotation that will be without Taijuan Walker for the rest of the sesaon and Robbie Ray for probably another month. Arizona right-hander Zack Greinke is to oppose Marlins left-hander Caleb Smith in the second game of the series Saturday. Buchholz made two starts with Philadelphia last April before the injury cost him a visit to Dr. James Andrews and the loss of the rest of the season. He has given up one run in each of his first three starts since being promoted from Triple-A Reno, going five, six and now seven innings. He played catch and threw bullpens with fellow unsigned free agent Jake Arrieta at Concordia University in Austin, Texas, until Arrieta signed a few weeks before the end of spring training, then signed a minor league deal with Kansas City before exercising his May 1 opt and joining Arizona three days later. Buchholz brought with him a resume that included two World Series rings and the 17th no-hitter in Boston history during a 10-year tenure with the team. "it was a different vibe for me," Buchholz said of his unusual winter. "But I'm not going to quit. That's not what we do. As an professional athlete, you are not going to quit. You have to have some drive and you have to know good things are going to come. That's why I landed here. I feel like I'm healthy. It wasn't ideal, but things happen for a reason, I'm a firm believer in that." 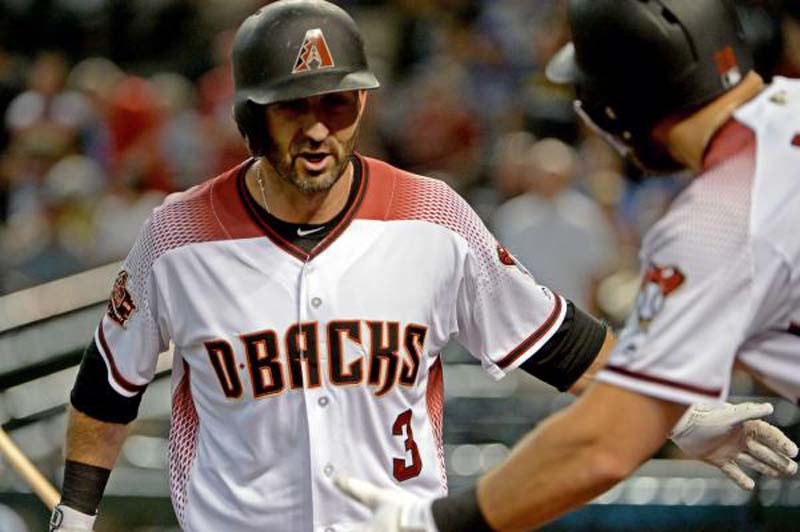 The Diamondbacks' offense, too, appears back on track after a stretch in which they scored 34 runs while losing 15 of 17 games. They had a season-high 12 runs against Cincinnati Monday, and the six homers Friday tied a franchise record accomplished six times, the last time when J.D. Martinez hit four against the Dodgers on Sept 4, 2017. Ketel Marte became the sixth player in franchise history to homer from both sides of the plate in the same game, also accomplished by MLBPA president Tony Clark, and catcher John Ryan Murphy had his fifth homer in his last six starts while hitting cleanup for the second straight game. Miami (20-37), which has lost six of seven to fall a season-worst 17 games below .500, did not have an answer for Buchholz or the offensive onslaught. Buchholz was able to mix and match with his fastball and offspeed stuff, and seven of his nine strikeouts came on four pitches or less, according to STATS LLC. "Today was more of a byproduct of not being able to stop them. We got behind early and it doesn't stop. it was not like we were able to stop the bleeding and have a chance to get back in the game. It kept getting away from us and we really couldn't stop them." Smith, obtained from the Yankees in the offseason, has the only Marlins' victory since May 25 with a 7-2 victory at San Diego on Monday. He is 4-5 with a 3.51 ERA in 11 starts, and he has put up some interesting peripherals. Among pitchers with at least 11 starts, Smith ranks third in the NL by allowing 6.3 hits per nine innings and fourth with a 29.9 percent strikeout rate. He leads major league rookies with 69 strikeouts, and he is 4-3 with a 2.21 ERA in his last seven starts. He has allowed three or fewer runs in nine starts. He has never faced the Diamondbacks. Greinke, 3-4 with a 3.65 ERA, has continued the home success that led him a 13-1 record in 16 starts at Chase Field last year. He is 2-0 with a 1.69 ERA in six home starts this season, limiting opponents to a .184 batting average. His strikeout/walk ratio is 7.29:1, third in the majors behind Corey Kluber and Miles Mikolas. He has never lost to the Marlins, going 5-0 with a 3.77 ERA in 10 appearances, nine starts, against them, with 52 strikeouts and 16 walks in 59 2/3 innings.